I started this topic to continue a discussion started by captwest on my pitfalls of positive reinforcement training topic so that the other discussion doesn't divert too far on this specific tangent. I don't believe that either the breeders nor the sympathetic people who accept rehomes are at fault or to blame. The real culprits are people who are not sufficiently committed buying baby birds and then later changing their mind or realizing it's not their thing. Worse yet, some want to get a different kind of bird to upgrade. Many people get a bird whether baby or rehomed without the experience/knowledge to properly tame/train it. Of course having experience is not necessarily requisite as we all must start some place, however, the desire to learn and acquire experience is without doubt mandatory. The trouble with baby birds is that they are easy/forgiving at first but after the baby stage is over, they are in no less need of taming/training than rehomes with "behavior problems." These neglected or improperly cared for babies become the rehomes. The real issue comes down to people making permanent homes for birds and educating themselves on proper handling/taming techniques rather than how the birds are acquired. Folks that buy a baby bird and keep it for life are certainly guilty of nothing and nor is the breeder that sold them that bird. Breeders who sell unweened birds or push birds on people that shouldn't be getting them may be a different story. I'm not talking about rehoming out of necessity here (owner got sick or died, moving to other country, allergies, etc) but rather the majority of cases which are about the novelty wearing off or being unable to handle the birds due to poor training. So captwest, I believe the discussion you started about breeding/rehoming is actually irrelevant and the real focus has to be on uneducated/undedicated owners instead. This is why I created this forum and share videos of my success in hopes that others will catch on and train their birds. Then they can enjoy them and wouldn't dream of rehoming them. To comment on what you said about people "upgrading" to a different bird-- that is how I came across my Senegals. The previous mom decided to replace the Senegals with an Amazon and was offing them to anyone who would take them on Craigs list. 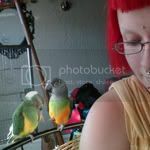 I consider it ridiculously fortunate that I happened to be looking that day, because after my inquiry, they offered me both the birds and their (WAY TOO SMALL) cage for the original fee they wanted for just one bird if i "would just take them away".They could've ended up in a real bad situation. My birds are AWESOME, playful, happy, talkative, curious, and don't scream....granted it may be the difference of my household vs the previous one....but I can't imagine what this woman was thinking. Does that mean some people who would otherwise adopt a rescue will get a baby. Yes. Is that morally wrong? No. Does that mean some birds will languish in rescues or be euthanized. Yes. It's harsh, but there aren't very many reasonable alternatives IMO. As I'm sitting here reading this thread I've come to realize my previous inclination toward rescuing as opposed to buying a baby (of any animal.. dog, cat, birds, ferrets) have been narrow minded. I still think rescuing the unwanted ones is important but with that can come a lot of interesting drawbacks. For example, Bailey, our Jack Russel mix, is generally afraid of male adults (human persuasion). Granted, it might be a socialization problem mixed with a high energy breed.. but we love her just the same as we would have if we'd gotten her at 8 weeks instead of 13 (I realize that's still puppy age). She was rehomed twice before we saved her from being shuttled around continuously. (That's a lot of moving around for a dog within such a short period of time). On the other end of the spectrum, we bought (from a pet store) our mini dachshund, Ari, when he was 8 weeks. I know where dogs like him come from.. puppy mills.. etc. He's CKC registrable although he would never win shows because he was clearly malnourished when he was being weaned. He doesn't have a full coat... patchy fur on his head and chest.. doggy elbows. We bought Tango, the love bird, from a great pet shop (albeit over-priced and a bit snooty). We gave him over to our green cheek's breeder because, well.. honestly? Among other excuses, we didn't have the knowledge that The Parrot Forum and Michael's Training Blog provided before we made the decision. Tango was a bit on the wild side, but what parrot wouldn't be after being picked on by all his brothers and sisters and cousins? I'm sure he would have made an excellent pet with training and I regret letting him go, but Max is amazing and he's teaching us new things about his personality every day. And we're learning properly how to deal with him via the forums here and the Trained Parrot Blog. Point is, rescue or not, they were all already born, so it doesn't matter where they came from. All we did was open our home to these wonderful animals. Better us than some other less patient family that would kick Ari out because he's confused about where he's allowed to poop. I would love to consider adopting an older bird in the future but the circumstances need to be just right. That's how I feel about any means of acquiring a pet. It's really about what's best for the animal; what you can provide for them, how willing you are to deal with its quirks and how often you can work with them. IMO, the needs of the pet owner matter, too. An uncomplicated, well-raised baby anything can be a joy... and while it is certainly wonderful to rescue animals, I really don't see anything wrong in going a route that's easier and more biased toward success. For example, I'd never suggest a first-time horse owner run out and get a rescue horse with behavior problems. Of course, in that market, the solid middle-aged citizen with good training and no serious issues is marketable and a baby wouldn't be the right choice either. But the point is that taking on an animal that is unwanted because it has health or behavioral problems really shouldn't be something that everybody should feel is their moral obligation. Most people are going to do much better -- and be more likely to provide a lifetime home for -- an animal which is sweet, initially healthy, trained and straightforward. There are challenges enough on that road. Well said, I agree entirely. entrancedbymyGCC wrote: For example, I'd never suggest a first-time horse owner run out and get a rescue horse with behavior problems. That is one of the reasons we bought Max from this breeder. He already knew how to step up and was mostly weaned (probably fully) when we took him home. He was still taking one formula feeding a day (although not much), which Dan and I took turns giving for the first few days but then progressively, Max decided he liked eating on his own better than from a syringe. He already ate his vegetables like they were going out of style. There was a lot that Betty did that we just didn't have to when we took him home. Good breeders make it easy! entrancedbymyGCC wrote: IMO, the needs of the pet owner matter, too. An uncomplicated, well-raised baby anything can be a joy... and while it is certainly wonderful to rescue animals, I really don't see anything wrong in going a route that's easier and more biased toward success. For example, I'd never suggest a first-time horse owner run out and get a rescue horse with behavior problems. Of course, in that market, the solid middle-aged citizen with good training and no serious issues is marketable and a baby wouldn't be the right choice either. But the point is that taking on an animal that is unwanted because it has health or behavioral problems really shouldn't be something that everybody should feel is their moral obligation. Most people are going to do much better -- and be more likely to provide a lifetime home for -- an animal which is sweet, initially healthy, trained and straightforward. There are challenges enough on that road. I agree with this concept completely. First time parrot owners getting a "rescue" to save money or out of good intentions may be setting themselves up for failure. They will realize that taking care of a problematic bird is too hard and end up rehoming it yet again. On the other hand if they eased into parrot ownership more gradually with a baby, perhaps they would keep the baby for life and then accept some rehomes down the line with the necessary experience and provide a permanent home for them as well. Everybody makes good points. I have both bought from a breeder and rehomed. I've also fostered several rescues. If I had "rescued" my first bird I probably would have been turned off of birds altogether. Usually, even acclimating a well socialized rehome has its challenges let alone a true rescue bird. It really needs to be done by people who are already bird people and know what they are doing. While I understand the need for rehoming, people shouldn't be pushing it on newbies. Some experienced people may not even have the patience for rehoming/rescuing and a bird ends up being passed to a new home yet again. That certainly does not help the bird. As for breeders, there is certainly nothing wrong with buying babies from a respectable, good breeder. A breeder should be researched and even visited in person if possible before purchasing from them. We certainly don't want bad breeders to continue breeding which they will if people keep buying from them. I do understand that in theory, if people don't buy from pet stores that get babies from mills, or from bad breeders, then they will stop producing these babies at the mill/breeder and we will end bad breeding practices once and for all. It's a great idea, but it's also extremely difficult to walk by a poor, baby bird who we may be able to save at a pet store. We are saying that we must sacrifice a few for the greater good. I find that idea difficult to live with so I just don't visit icky pet stores and try to stay away from places where breeders might advertise. At this point, I'm rambling, so I'll just say that each individual has to make their own moral decisions. This isn't a black and white issue. Michael wrote: I agree with this concept completely. First time parrot owners getting a "rescue" to save money or out of good intentions may be setting themselves up for failure. They will realize that taking care of a problematic bird is too hard and end up rehoming it yet again. On the other hand if they eased into parrot ownership more gradually with a baby, perhaps they would keep the baby for life and then accept some rehomes down the line with the necessary experience and provide a permanent home for them as well. I agree fully with this as well, since it's what happened to me. A few years ago I was offered a female eclectus parrot free to good home from a friend of a friend. It was a stupid, stupid choice on my part to take her in (I fell into the 'good intentions' part I suppose). The poor bird had not been treated well, was bitey, unsociable (it would step up but god help you if you tried to handle it for long), was a feather plucker.. did the 'toe tapping' thing, etc. I wanted to help it, but all that came of the experience was that I was a temporary shelter to the poor girl before I too had to pass her on to someone else, because I was an ignorant fool. I ended up giving her to a bird shelter after a few months. There were a variety of personal circumstances that came up (that I won't go into here) that rendered me completely unable to give the bird the time it needed, and my lack of experience with parrots (I'd only had a cockatiel prior to the eclectus) meant that I really made no progress with her (I still have the scars on my fingers from the bites I received). I deeply regret that I didn't persevere with that poor bird, but between my lack of experience with parrot behaviour problems, and my own personal problems, it was an utter recipe for disaster. Rescuing animals is a very noble pursuit, but I learned the hard way that the amount of knowledge to take in a rehomed parrot and be successful with it -the average person just doesn't have it, and it can easily do the parrot more harm than good. If I was in that situation now, with the knowledge I now have? I would take her in again, but not until my hands on experience was equal to the theoretical knowledge I have. I'm getting a baby cockatiel from a very reputable breeder for the above reasons. When I feel confident enough I'll certainly take in a rehomed bird, but I don't want to contribute to the problem of having to rehome the rehomed bird. I still berate myself about the poor eclectus and how stupid I was. 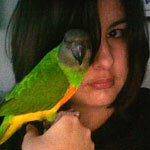 I don't believe inexperienced parrot owners should take in rehomed parrots due to what happened to me. There can be exceptions of course (my experience was more of a 'worst case scenario' type thing), but even meaning as well as I did, my inability to handle the eclectus meant I just contributed to that poor bird's problem - of being passed around from home to home. If people do decide to take in a rehomed parrot (and it's honestly a fantastic thing to do if you're capable, hats off to anyone here who does it), I can't emphasize enough - do your research! Find out everything you can about the bird - why it's being rehomed, any behaviour problems, everything you can. Make sure you're not biting off more than you can chew - for the bird's sake.